How can you create a future fit store, when you don’t even know what the future will look like? That’s the challenge most retailers are facing right now – and others are still trying to optimize their offering for the current consumer, let alone look ahead to what futures will want. Forecasting the direction of physical retail is not a new venture for us. This time last year, iVend Retail asked the question ‘is your store fit for the future?’ in a blog post, looking at some of the key areas in which bricks-and-mortar needed to innovate alongside changing shopper expectations. In 2015, we discussed how many retailers viewed technology as a ‘bolt on’ for the bricks-and-mortar experience, and we’re pleased to report that the concept of physical shopping at the heart of a digitally-driven customer experience has matured over the past twelve months. Industry conversations are now very much focused on customer engagement as being the primary purpose of the store, with greater recognition that a shopper does not have to buy anything for stores to be an important consumer touch point. The idea of the store as a theatre is also still very much alive, although – as we pointed out last year – many retailers still rely on their flagship sites to showcase a new, interactive experience. More work needs to be done to make digital engagement technologies a core part of the store estate. Our first look at the store’s future called for the end of siloed channels, departments and processes, to enable a truly omnichannel retail strategy. Again, there has been good progress in this area, with a greater focus from retailers on getting their back-end infrastructure and people reconfigured for a connected retail environment. Particularly within inventory management, we’ve seen a rise in interest in moving to a single stock pool to better manage demand across the organization. The next step will be to ensure that operational agility it brought to the customer experience, by connecting store associates to business information such as stock availability. Even 12 months ago, retailers were starting to restructure their businesses around the customer, resulting in the loss of jobs, but the empowerment of those who remained. This will continue, and technology will accelerate this change, to the point where shoppers will encounter fewer associates on the shop floor, but those who are working will have the connected devices to offer a richer services than they can at present. Last year, we expressed our surprise that mobile store technology had not been widely adopted by retailers. Although progress has been made over the last 12 months, it is still not commonplace for shoppers to be served by a store associate using a mobile POS device. However, the increased discussion around customer-centricity is bringing the role of mobile within bricks-and-mortar increasingly into retail conversations. We are definitely seeing more mPOS solutions within stores than a year ago, and this trend will gather momentum as retailers look for cost-effective ways to manage their store visitors’ appetite for digital interaction. 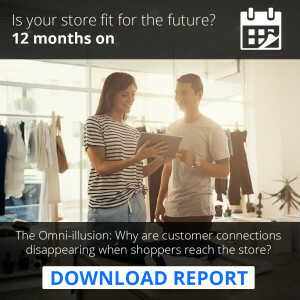 How future fit is your store? Join in the discussion with us on Twitter – @iVendRetail_EU. Senior Vice President for iVend Retail Europe from CitiXsys, Richard Kolodynski has over 30 years professional experience in global sales and channel development. A high profile name in retail circles, Richard gained business, account management, leadership and technology-related expertise working with top-tier retail players. He is currently responsible for strategic alliances, retail strategies, commercial management and channel partner recruitment and management throughout Europe.